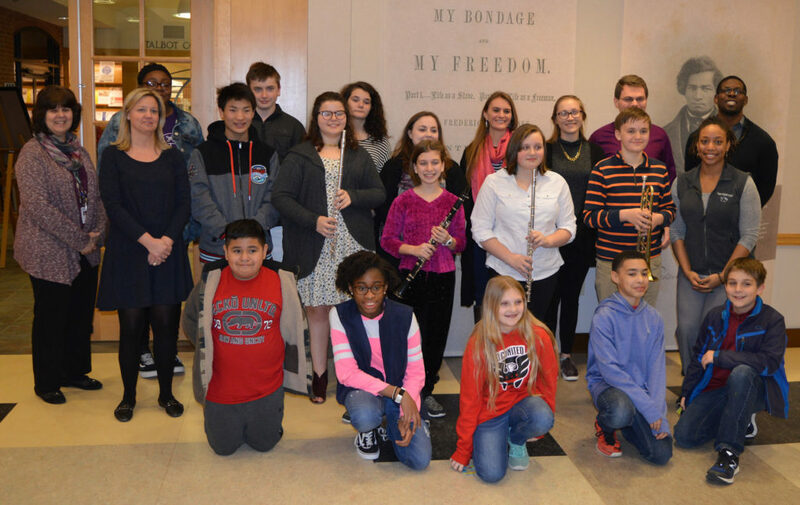 Band students from Easton Middle School (EMS) recently held a Student Recital at the Talbot County Free Library in Easton, demonstrating what they learned from the University of Maryland’s Potomac Winds Ensemble as part of a new Artist-in-Residence Program. Pictured back row, left to right, are: Bechora Aguoru, David Ludwig, and Mara Stoyanov, Potomac Wind members. Pictured middle row, left to right are: Mrs.Donna Ewing, Mrs.Jackie Valcik, David Gardner, Elaina Steinly, Anna Lesher, Charlotte Moseley, Ian Branic, and Mrs. CJ Henry. Pictured front row (kneeling) are: Eduardo Diaz-Chavero, Olivia Tagbo, Merceyde Wilkins, Ahltair Baltimore, and John Schwaninger. Easton Middle School musicians, left to right, Anna Lesher (clarinet), Elaina Steinly (flute), Mara Stoyanov (flute) recently performed a recital at the Talbot County Public Library as part of a new Artist-in-Residence Program. A committee from the board of the Talbot County Arts Council then brought together the University of Maryland (UMD) School of Music, the music and social studies faculty of Easton Middle School, and Chesapeake Music to discuss the issue. 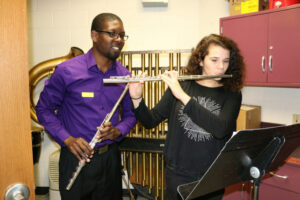 The objective of the group was to provide the student body a rare opportunity to learn from the skill and experience of graduate-level musicians, to both inspire a lifelong love of classical music among the general student body and allow music students to benefit from the skill and enthusiasm of young professional-level musicians, who are qualified as music teachers and who are participating as volunteers. 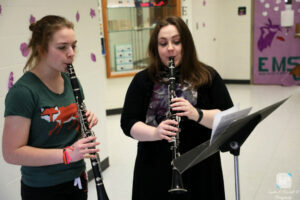 A number of EMS students who participated in the recital, had been working on solo and ensemble work, getting ready for State of Maryland Solo and Ensemble Festival. Both Ian Branick, a 7th grader, and Anna Lesher, an 8th grader, found that Potomac Winds helped them with their sound and how to make the music sound better – including the dynamics of their playing. Given the apparent success of this year’s program, it is hoped funding will be found to continue the initiative in future years at Easton Middle School and possibly expand the project to include other local schools. The program is made possible by grant from the Artistic Insights Fund of the Mid-Shore Community Foundation, with funds from an Arts-in-Education grant from the Talbot County Arts Council, using revenues provided by the Maryland State Arts Council. Carpe Diem Arts also supported the program. 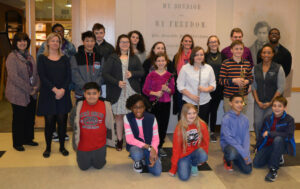 #1: Band students from Easton Middle School (EMS) recently held a Student Recital at the Talbot County Free Library in Easton, demonstrating what they learned from the University of Maryland’s Potomac Winds Ensemble as part of a new Artist-in-Residence Program. 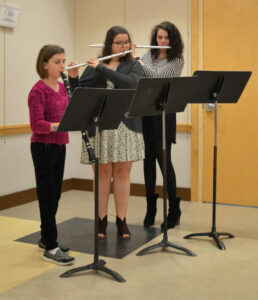 #2: Easton Middle School musicians, left to right, Anna Lesher (clarinet), Elaina Steinly (flute), Mara Stoyanov (flute) recently performed a recital at the Talbot County Public Library as part of a new Artist-in-Residence Program.